Haryana Postal Circle has recently announced a job notification for 682 Gramin Dak Sevak (GDS) posts. Interested and eligible aspirants seeking to get Haryana State Government jobs can apply through online at indianpost.gov.in. The online applications for Haryana GDS posts will be accepted from 3rd December 2018 to 2nd January 2019. Aspirants can hurry up to apply for Haryana GDS posts as soon as possible. 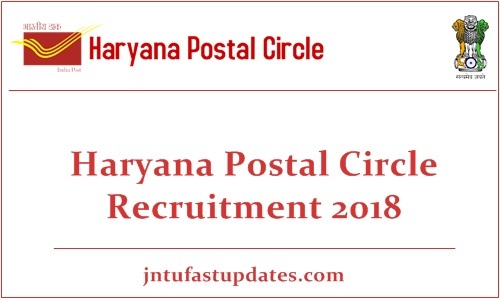 Before applying for the announced posts, candidates can refer to the Haryana Postal Circle GDS notification 2018 PDF for more details such as eligibility criteria, application process, selection process, and other details. Haryana Postal Circle is the state government organization that works for various postal needs of the state. The postal circle was formed by Government of Haryana. The Haryana Postal Circle releases various notifications every year. This year the Haryana Postal Circle has rolled out a recruitment notification for 682 Gramin Dak Sevak posts. Candidates must have the minimum educational qualification of Matriculation/SSC/ or equivalent educational qualification from any recognized board to apply for Haryana GDS posts. Age limit of the applicants must be in between 18 to 40 years. Reserved category candidates will get age relaxation as per the Haryana state government norms. Candidate selection will be done through written test, academic merit, and document verification basis. Shortlisted candidates will get a good pay scale and grade pay as per norms. Number of Vacancies 682 posts. Candidates must have the minimum educational qualification of Matriculation/SSC/ or equivalent educational qualification from any recognized board to apply for Haryana GDS posts. Age limit of the applicants must be in between 18 to 40 years. Reserved category candidates will get age relaxation as per the Haryana state government norms. Candidate selection will be done through written test, academic merit, and document verification basis. Shortlisted candidates will get a good pay scale and grade pay as per norms. Candidates can go through the pay scale details from the following table. Applicants have to pay the application fee/processing fee as mentioned below. How to Apply for Haryana Postal Circle GDS Jobs? Interested and eligible aspirants can apply through online at indiapost.gov.in OR Haryanapost.gov.in. The online application form will be accessible from 3rd December 2018 to 2nd January 2019 for the applicants. By paying the requisite application fee, and filling up the application form aspirants can apply for Haryana GDS jobs 2018.